There’s a nerdy theology joke that I absolutely love. Here it goes: There’s three pastors in hell talking, trying to figure out why each other is there. One is a Nazarene, one is a Calvinist, and one is a Lutheran. The Nazarene says, “I think I’m here because I didn’t attain perfection.” The Calvinist says, “Well, I guess I was just predestined to be here.” And the Lutheran says, “I’m here because I did a good work.” I think a lot of us gospel-centered folk can relate to the Lutheran. There is nothing you can do to make God love you more, and nothing you have done that makes God love you less. If you attend The Response Church or follow us online, you’re probably well aware that our church is serious about the gospel. You will constantly hear of salvation by grace through faith in Christ alone – that there is nothing you can do to make God love you more, and nothing you have done that makes God love you less. We are saved because of Christ’s work, not our own. The same grace that saves us is the same grace that keeps us. We are at the pinnacle of God’s love even now, and therefore we love because Christ first loved us. We don’t have to work for our salvation. In our ministry, you’ll hear these things said time and time again. So our church gets the gospel, right? Then why do I hear sometimes hear from our people (often from myself as well) frustrations of not experiencing God, not trusting in him, and feeling distant from him? 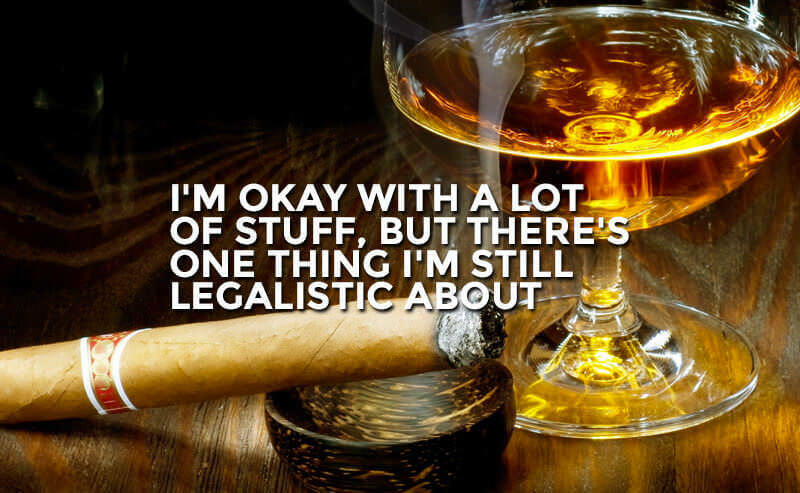 I think it’s because in our passion to be gospel-centered, genuine, and non-religious we sometimes become legalistic about not being legalistic. What I mean by this is that I fear that many of us don’t want to base our relationship with God on good works or don’t want to try to earn his love to such a degree that we don’t work at cultivating our relationship with God at all. In our passion to be gospel-centered, genuine, and non-religious we sometimes become legalistic about not being legalistic. However, as with any relationship, whether it’s with another person or with God, it takes work. It takes discipline. The spiritual disciplines of study, prayer, fasting, etc. are vital to a healthy relationship with God. Inevitably, there will always be days when we don’t want to do these things. These are the days when we are in desperate need of discipline to help push us through. We don’t participate in the spiritual disciplines to earn God’s approval; we participate in them because they are a means of creating space for God to change what we are believing in our hearts. Belief should always be the sole purpose and end goal of the spiritual disciplines. We don’t participate in the spiritual disciplines to earn God’s approval; we participate in them because they are a means of creating space for God to change what we are believing in our hearts. So all that being said – my answer to the question, “Why does God seem distant?” is this: It’s easy to miss something you’re not looking for. The gospel should motivate us to seek God with our whole hearts and to be disciplined in spending consistent time in prayer and study, as well as regular participation in Christ’s Church. When I see the God that is revealed in the gospel of Jesus Christ, I want to know that God more intimately; however, sometimes I still don’t want to spend time with God. This is where the disciplines greatly benefit the Christian. The reality is that the person spending consistent time seeking God is inevitably going to be more intimate with him and know him more deeply (and thus resemble him more clearly) than the person who isn’t spending any time with God at all. I am convinced that God wants to spend time with us more than we want to spend time with him. In light of this, if the spiritual disciplines are primarily a place where we make ourselves available for God to work in us and speak to us, it only makes sense that those who make themselves more available to God will likewise be the ones who experience him more deeply. It’s not that God isn’t showing up – it’s that we’re not looking for him. It is true that faith is a gift from God. But as with any gift we receive, we are always called to steward that which we have been given. Ultimately, our beliefs are always what shape our actions, but it is equally true that our actions serve to shape our beliefs.